Don't let the gas station parking lot and Ecstasy Barber Shop next door lower your expectation for this new Korean joint. In Denton, the exterior of a restaurant holds no value. Take Keiichi, for example. You could easily pass the place by, what with it's crummy-looking parking lot and nondescript frontage, but inside, you'll find some of the best food in North Texas. While Czen might not be at Keiichi levels, it definitely warrants a visit or two. The staff were friendly and courteous, even when my date took 20 minutes to decide on the bento box which included a variety of traditional Korean dishes such as seaweed, kimchi and tempura chicken. 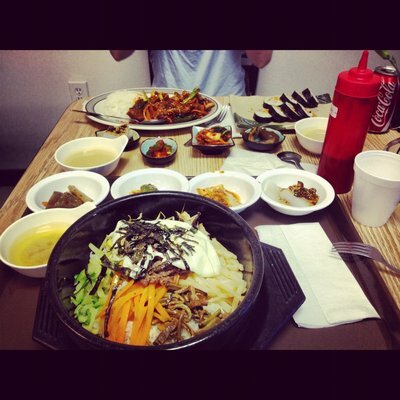 After ordering the much anticipated bibimbap, we were surprised by the authenticity and presentation of the meal. It sizzled, but did not fizzle. If you aren't a stone bowl pro, make sure you go with the egg, let the bowl cook the rice until crispy and don't be stingy with the sauce. While the bulgogi not quite as eye opening an experience as the bipimbap, it, too, was quite stellar and among the best we've had. The friendly staff did an excellent job communicating every detail of the layout for us newcomers, and we left feeling like we had experienced a rich and satisfying meal. I don't think you can go wrong ordering anything from Czen, because they give you a little taste of all things Korean. Everything from the miso soup to the noodles and eggplant was delicious and fresh. The price was surprisingly fair at $7-$10 for meals that are easily sharable. We'll be walking over to this little place many times since its conveniently located on UNT's campus. Czen is a worthy replacement for Bulgogi House and a pretty high competition to Denton's other Korean restaurants, Royal East included. Czen is located at 408 N. Texas Blvd.